You did it!!! 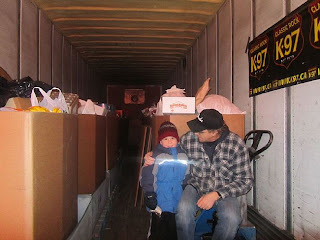 Your generosity enabled 18 Wheels of Christmas to deliver 26 skids of food for a total of 24,250 pounds to the Calgary Food Bank on December 18th. The centre of attention was a Christmas tree made entirely of the baby food purchased with cash donations collected throughout this year’s campaign. 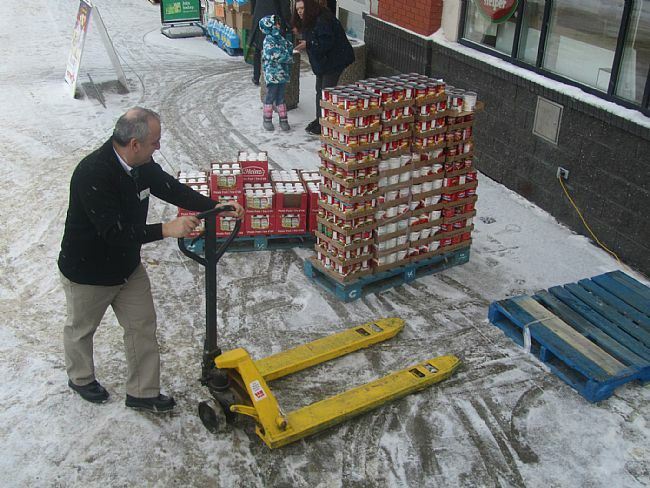 We also had an additional 1 ½ skids of baby food donated by Heinz Canada and Save-On-Foods. The Rotary Youth built a Christmas tree out of these jars and had it on display at Fifth Avenue Place in support of the Food Bank’s annual food drive. In support of this year’s campaign we sent 2 cheques totaling $3,550.00 to the Calgary Food Bank. 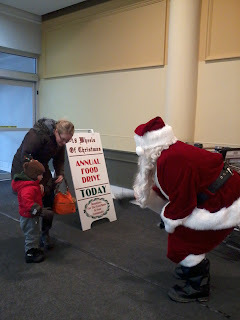 18 Wheels of Christmas was again invited to Lake Bonavista Promenade, Douglas Square Mall and for the second year to Fluor Canada Jeans Day Event for Food. Along with our loyal supporters such as Stan Poulsen Trucking, Bess Tank Lines, Rosenau Transport, Boghean & Company, Style-Craft Printing, Midwest Surveys, Vitran, TST Overland, Consolidated Fast Frate, Desa Glass, Univar Canada, Gibson Energy we also found this campaign to have a few new ones. We would like to thank Westfreight Systems, J&R Hall, Hill Bros., Mika Trucking and The Filling Station for their participation to this year’s campaign. Without your donations and contributions we would not have met our target of filling the trailer. Thank you!!!!!!! Lloydminster, Sparwood BC and as far north as Dawson Creek and Fort St. John, BC. 18 Wheels of Christmas consists of a strong team of volunteers, drivers, dispatchers and warehouse staff, mechanics and graphic department who give up their evenings and weekends to help in making each campaign a success. 18 Wheels could not do without you. Thank you!!!! Here are the people that we would like to thank for their donations of food and money to make this year a great success. 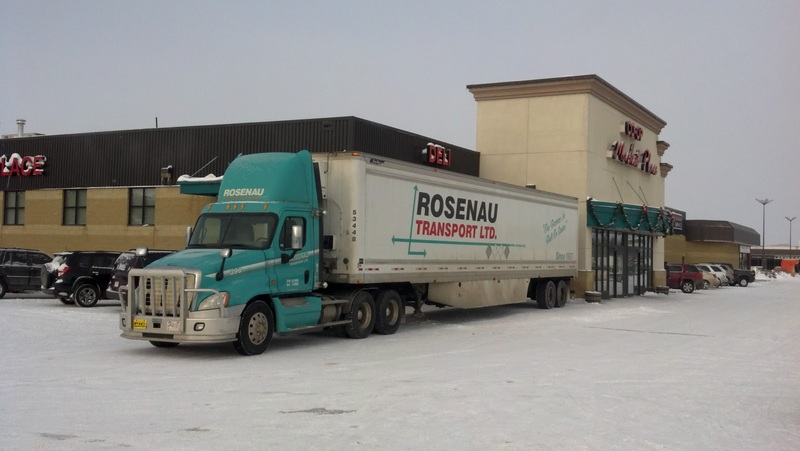 ROSENAU TRANSPORT’S 18 WHEELS OF CHRISTMAS ROLLS UP TO THE SASKATOON FOOD BANK & LEARNING CENTRE! WHERE: Saskatoon Food Bank & Learning Centre, 202 Avenue C South, Saskatoon, SK. 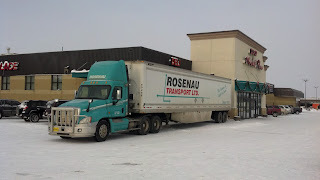 Wednesday, December 18th at approximately 10:30 AM, Rosenau Transport’s beautifully decorated semi will be pulling up to the Saskatoon Food Bank & Learning Centre with a very special delivery. 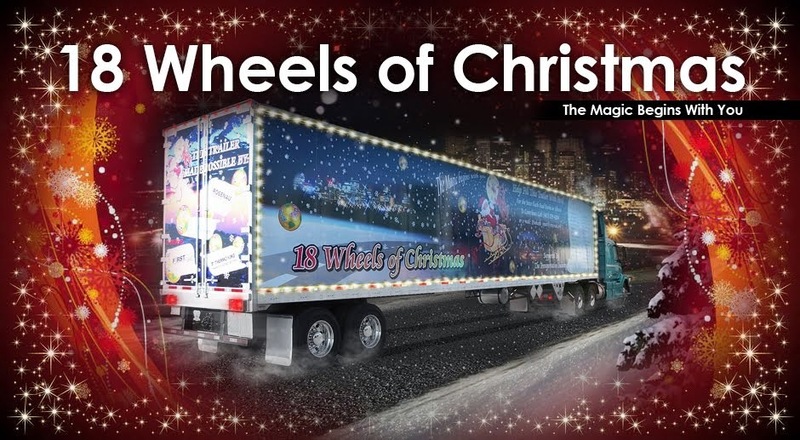 18 Wheels of Christmas, conceived in 2002, was created to give the Global Transportation Community a way to give something back to the communities in which they live and work. As stated on the Rosenau website, "The concept, though simple, has far reaching effects for the less fortunate. Our ultimate goal is to use 18 Wheels of Christmas to stock every Food Bank in every community across the country at Christmas time!" 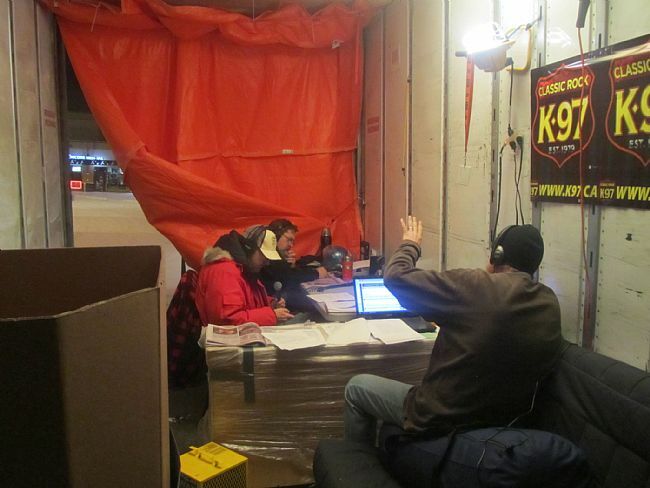 For the past five years, Terry Evans of K 97 radio has pledged to live in the 18 Wheels Of Christmas trailer until it is full. 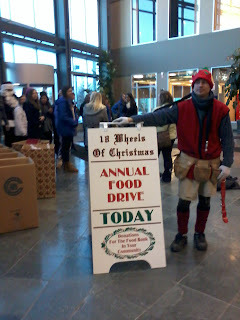 Once again, he did not disappoint the Edmonton Food Bank. 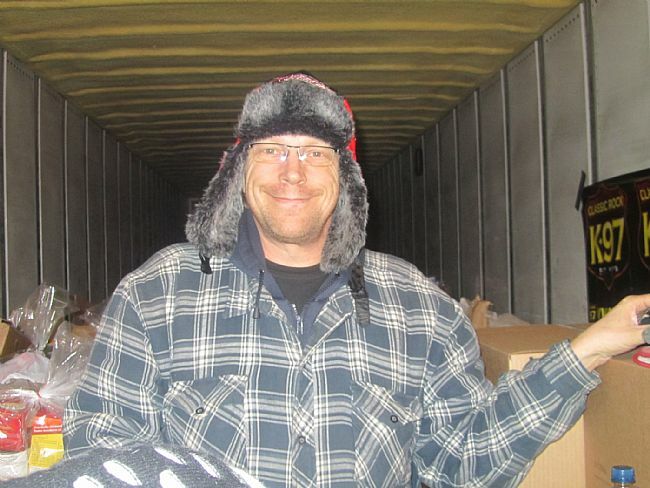 Congratulations to Terry, the Edmonton crew and 18 Wheels Of Christmas. 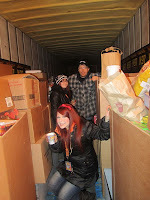 Ask and Ye shall receive...one full trailer of donations!! The Crowsnest Pass is a community in decline, between the layoffs at the mines and the Devon plant closing, hundreds of people are now without work. This is hard enough when there is no one else involved but life becomes more difficult when the family includes children, especially young children, and when it is Christmas time. These out of work parents all want to give their children the happiest Christmas possible, which includes having toys under the tree Christmas morning. Knowing how difficult this simple wish can be for some parents to fulfill K&K Forwarding, Rosenau Transport as part of the 18 Wheels of Christmas 2012 campaign teamed up with the Women’s Resource Center and the Stones Throw cafe in order to collect toys for the children whose parents cannot afford them. 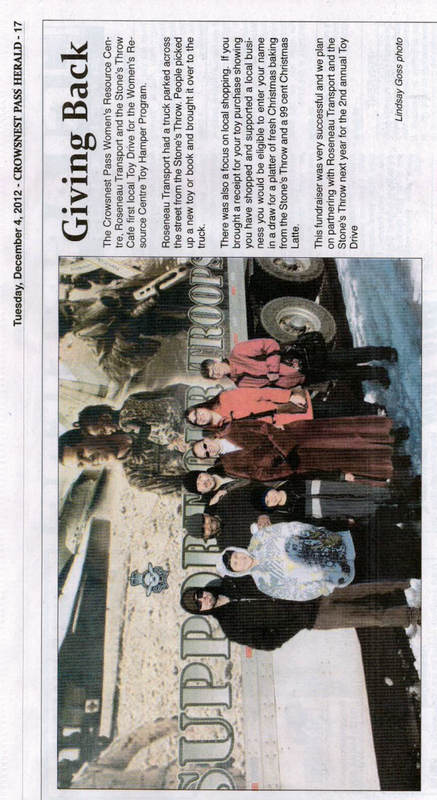 On November 27 the ‘Support our Troops’ trailer was parked across the street of Stones Throw Cafe in Blairmore. Together Steve Galbraith (Sparwood Operations Manger), his fiancé, and drivers Steve and Kalvin (with two of his sons) gathered donations of toys and books along with the odd donation of food for the food bank. The toy drive was scheduled from 10am to 2pm, but as more people were arriving and asking if they could come back with toys the drive went until 3pm. All of the toys were high quality and everyone brought more than one toy, one lady brought an entire trunk full of toys. Even those people who did not bring a toy gave money so more toys could be bought. 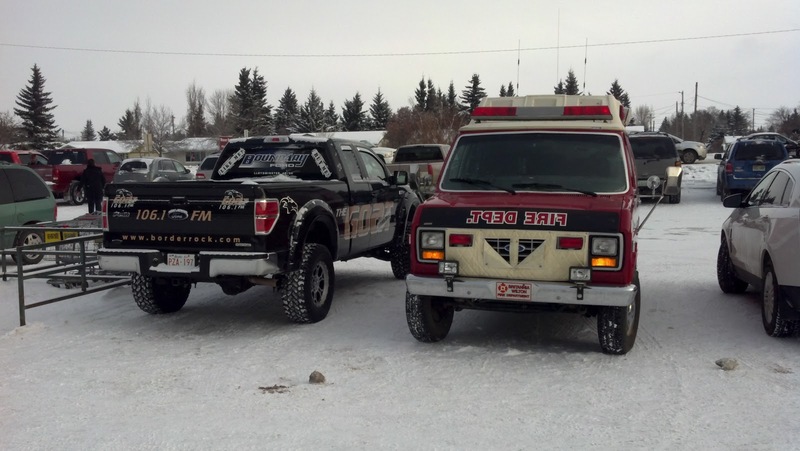 It was heart warming to see the people donate nearly $2400 worth of toys and $315 in cash. 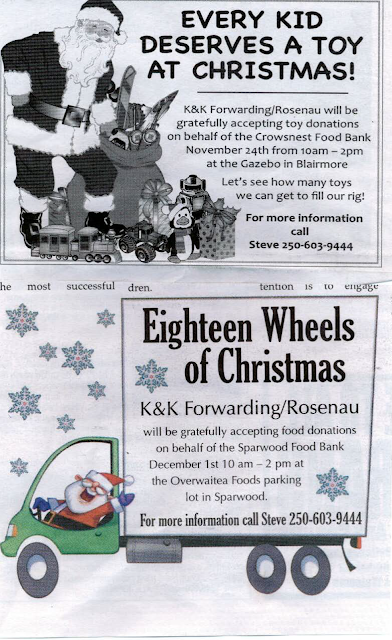 Thank you to the volunteers and to all those who donated this Christmas will be a merry one for the children of the Crowsnest Pass. Hopefully next year we can put smiles on the faces of even more children. The totals are in for the Food Drives done in the Lloydminster areas. Vermilion, Manville and Wainwright collected a total of $ 7,536 dollars in donations and an astounding $25,000 in Lloydminster itself. Well Done Everyone..! What goes on at 6 A.M. on a Friday morning??? We can tell you what. 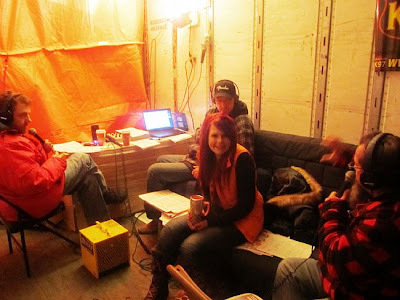 While some of you were still cozy in your beds and some of you were in your kitchen enjoying a hot cup of Java or Cocoa some of us were outside freezing taking donations of non-perishable food items, frozen turkeys and dollars. Fluor Canada has this amazing team which works under the banner of Fluor Cares. This is a committee of dedicated individuals who give their time organizing event days to raise money for different charities. This event starts at 6AM when it is very cold and goes until 9AM when it is a little warmer (not much) and slowly we make our way into the lobby. 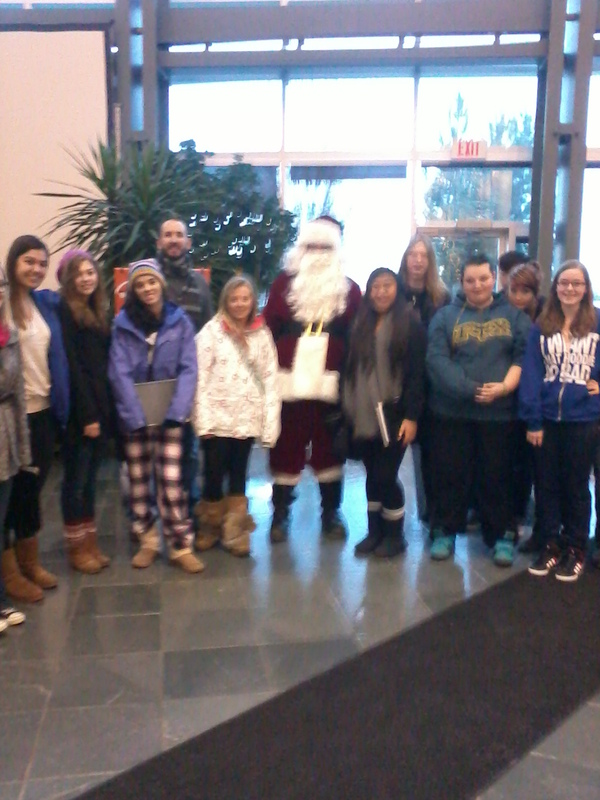 Santa and his elf Skippy hand out candy canes and warm wishes. 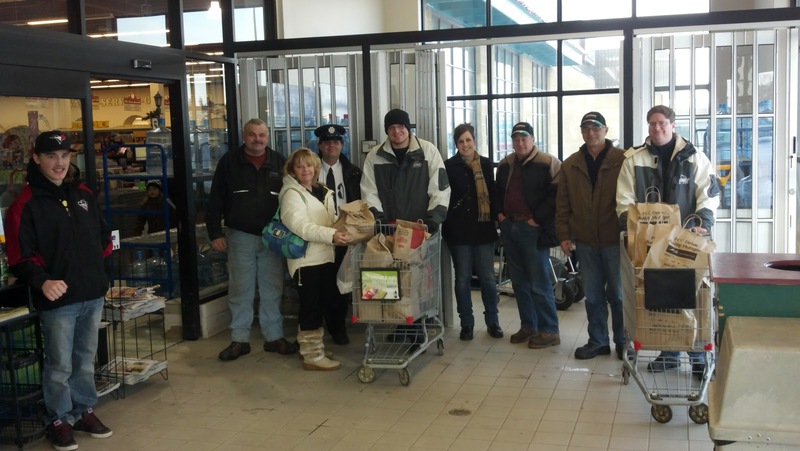 In 3 hours these team members donated $3,423.45, 12 Food Bank gaylords of food and 5 frozen turkeys. 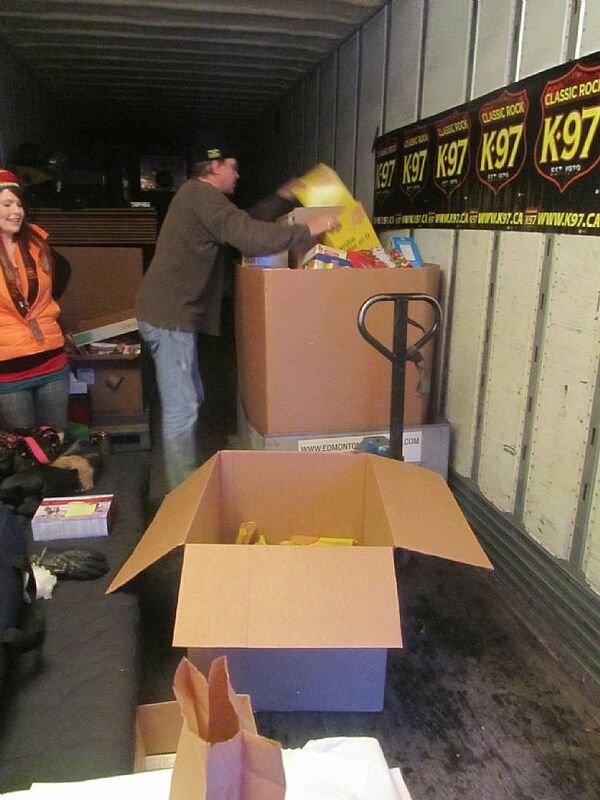 These donations came from 4 of their locations 2 in the Sunpark Plaza, 1 in Quarry Park and 1 in Canyon Meadows. Thank you to all the Fluor members!!!!!! 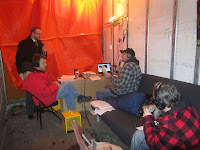 18 Wheels of Christmas was invited back for the 10th year to Lake Bonavista Promenade where we are never disappointed. The morning was fairly chilly but the weatherman promised it would warm up. It never did but the cold certainly did not keep this community locked in their snug homes. When we arrived Vyetta and Bev were already there waiting for us. We got the sandwich boards out the music blaring and then Santa made his arrival known with his huge HOHOHO voice. As soon as we had opened the trailer doors Maureen (the Safeway Manager in this mall) rolled out a shopping cart full of hampers which her and her team had collected for us the day before. Talk about a good start to a chilly day. These types of donations went on from 9:30 AM right up until we closed the trailer doors at 1:30 PM. We collected an astonishing 12 Food Bank gaylords full to the brim and $465.00 cash (for baby food). Lake Bonavista really knows how to share the spirit of the season. Our 18 Wheels of Christmas Santa put smiles on many of the youngsters out shopping with their parents his candy canes went quite fast. We were treated to the most delicious lemon mango muffins ever freshly made and still warm by the ladies at THE FRIDGE. Every year this shop treats us to something special last year it was apple cider. Our time for the season is starting to wind down… this Friday we will be found at Fluor Canada for their Fluor Cares Jeans for Food event and then we must send the Christmas Trailer to Jodi and Ken in Edmonton for Terry Evans of K97 to live in the trailer until it is full. Here’s hoping the weather is warmer for you this year Terry than it has been in the past. 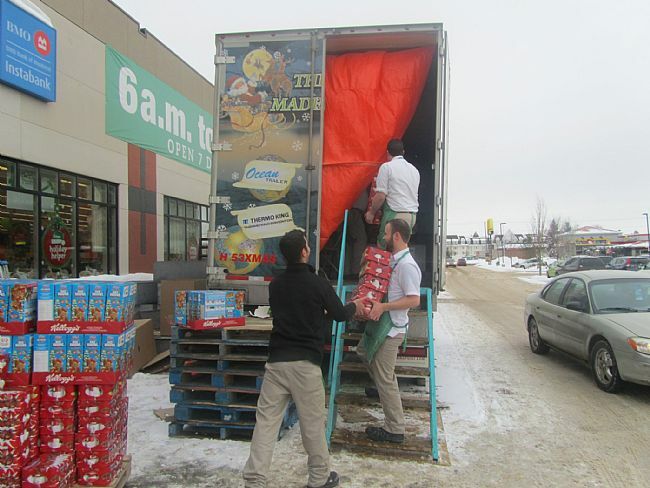 18 Wheels of Christmas always delivers to the Calgary Food Bank a Christmas tree made entirely of baby food from the generous cash donations we receive our warehouse staff builds it and it is the first thing to come off the trailer when we deliver. This has become our signature picture for the last 10 years. This year things have been changed up a bit. 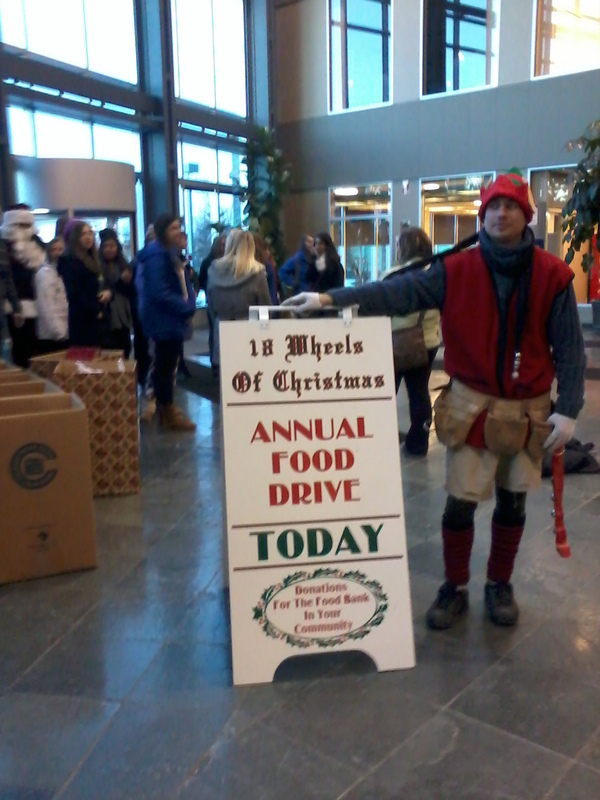 This year in support of 18 Wheels of Christmas the Food Bank asked if they could do it themselves. 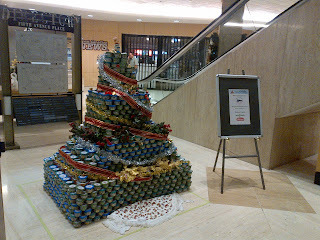 The fine folks of the Food Bank went to work and found a donor who would donate enough baby food for the tree. They also had in mind who they would like to build it. The picture you see here is the Christmas tree the Rotary Youth built with the truly amazing donation of a skid and a half of baby food from Save-on-Foods and Heinz Canada. 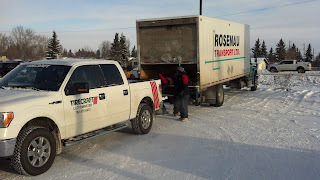 The tree is located at Fifth Avenue Place in Calgary and will be delivered by 18 Wheels of Christmas on December 18th. Thank you to everyone who was involved with this amazing project.